The whole idea behind the PowerBook, as noted by Adam Robert Guha in PowerBook or PowerDictionary?, was "small, powerful, book-sized Macintosh laptop computers." Apple has had some stunning successes using that model. Imagine a notebook computer with an 8.5" x 11" footprint, just 1.8" thick, and weighing only 5.1 pounds. Sound appealing? Well, Apple introduced just such a PowerBook in October 1991. The PowerBook 100 did have some limitations. The 16 MHz 68000 processor was nothing to get excited about and the 640 x 400 screen was a bit small and only showed black and white - no grays. The PB 100 came with 2 MB of memory, expandable to 8 MB, and included a 20 MB or 40 MB hard drive. Shades of the iMac, the 100 didn't even have an internal floppy drive! The two-hour battery was something of a breakthrough back then, as was the innovative placement of the trackball in front of the keyboard rather than beside it. One year later, Apple introduced the PowerBook Duo 210. Like the 100, it did not contain a floppy drive. Unlike the 100, the Duo was designed with some missing features that could be added with a dock, such as a floppy drive or SCSI port. The footprint was insignificantly smaller, at 8.5" x 10.9", but the Duo was a half-inch thinner at just 1.4". It was also nearly a pound lighter than the 100, weighing a svelte 4.2 pounds (under 2 kg). The screen showed 16 levels of gray, held 80 MB of data, ran a 25 MHz 68030, and could be expanded from 4 MB to 24 MB of memory. 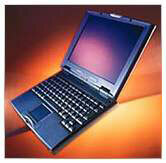 The Duo series lasted over a decade, culminating with the 6 pound 100 MHz PowerPC-based Duo 2300 of 1995. Unfortunately, the trend was mostly to bigger, heavier PowerBooks. One of the best developments in PowerBooks was bigger screens. The PowerBook 1400 was the first to sport an 800 x 600 display. It also had a removable CD-ROM drive. Unlike the PB 100 and the Duos, the 1400 had all the usual Mac ports and an internal floppy. The size was slightly bigger: a half-inch wider and deeper, two inches thick, and just under 7 pounds, depending on the precise configuration. Thanks to G3 upgrades available over the years, the latest from Sonnet, this remains a very viable field computer. There's something about the size, shape, and even the heft of the 1400 that just feels right. And, as demonstrated with the iBook, 800 x 600 displays remain viable to this day. Intended originally for the Japanese market, the PowerBook 2400 had an unusual 10.5" x 10.5" footprint. It was one-tenth of an inch thinner than the 1400, but weighed just 4.4 pounds (2.0 kg). The most common complaint was that the keyboard was a bit small, but it also had full-sized arrow keys in an inverted-T configuration. Very nice! Like the 1400 and iBook, it has an 800 x 600 color display. It has a huge following in Japan and is quite popular among the few who own it in the rest of the world as well. There were a lot of different rumors preceding the iBook. Some said it would be small, light, and inexpensive. Others said it would be very rugged. The iBook is not small, not light, very rugged, and quite reasonably priced for a portable. It's definitely not the thin, light laptop many were hoping for. It's a 6.6 pound (3 kg) portable with a huge 11.6" x 13.5" footprint that measures just over 2" thick. Since the 1400 and 2400 were discontinued, Apple has missed out on the compact laptop market. The Pismo is lighter than the iBook and 1400 at about 6 pounds, but it also has a 10.4" x 12.7" footprint. Apple needs a field computer, a real notebook machine for writing, handling email, and surfing in the field - something closer to the PB 100 or 1400 in footprint, closer to the Duo 210 and 2400 in weight. And I'm sure they could do it. The iBook and Pismo have a keyboard that's almost precisely 11" wide, which means a new PowerBook could be just 11.2" wide and have room for the keyboard. Apple might have to go with a screen a bit smaller than the 12.1" used in the iBook; the 1400 had a very nice 11.3" 800 x 600 display. Using that, the PowerBook Lite could have a footprint of about 8.8" x 11.2". Today's laptops are thinner. Pismo is 1.7", and the Windows world has 1" thin laptops. Let's not get too ambitious and propose a 1.7" thick computer. The Wintel world is where most of the laptop innovation is these days. Sure, Apple gave us trackballs, trackpads, drive bays, and six-hour batteries, but the Wintel world has touch screens and a huge variety of screen and computer sizes. We have two models: iBook and Pismo, each available in two speeds. If I wanted a field computer to supplement my desktop, I'd want something small, light, and moderately rugged. Although heavy, a PowerBook 1400 with a G3 upgrade could do it for me, especially with a wireless networking card in the PC Card slot. How much better if Apple fulfilled the promise of the PowerBook 100, Duo series, PB 1400, and PB 2400 with a 4.4 pound (2.0 kg), AirPort ready, 8.8" x 11.2" x 1.7" notebook computer with a four-hour battery.